…to build a winning business? Really? I started running when I was 13 years old. It was just about that time that I stop growing tall and started growing…out. Running was a good way to keep my weight down. I liked how I felt when I finished my run. So, I stuck with it. I grew to love it. A friend of mine got me going on road races and I ran a couple of marathons. To finish a marathon you have to be mentally tough and train well enough. I kind of lost interest in marathoning when my son was in school and I was busy working. Well, Max is in college, and my business is booming. I got the fever to do another one. I found an online training plan. I ran according to schedule (except for a few runs) and felt pretty good. I even completed a 22 mile run…without throwing up or falling down…a few weeks prior to the race. Then, with one week to go, I went for an easy 8 mile run and disaster struck. I started out too fast and the weather was a bit cool…and I felt something tear in my calf. OUCH. I hobbled home, barely walking, and fairly freaked about the implications. Still, an injury is a manageable event. I iced and took ibuprofen. I had acupuncture. I said prayers and focused on good thoughts. And I walked gently. The morning of the marathon, I felt pretty good. Until I started to run. My leg flared up like it was stuck with a red hot poker. I limped towards the STARTING line and realized that my plan had failed me. I was completely humbled. I walked across the starting line. I kept walking. My leg started to loosen up a little, but I no hope of going 26.2 miles without wheels and a motor. Then, I saw Sharon. Sharon is a professional Pace Setter. She trotted past me, carrying a balloon bouquet (it makes it easier to spot the Pace Setters), and announced that if I could stick with her, I could finish. And, that she would finish in exactly 5 hours and 30 minutes. I picked up my walking pace and turned my focus on that bundle of balloons. My plan failed. Sharon had an alternate plan: Do what I tell you. I threw away everything I thought I knew about running and marathoning and what I was capable of. I focused on Sharon and did what she told me to do. For the first few miles, I stagger/skipped when the others ran because I couldn’t take a full step. She told us to walk a minute every mile to recover and maintain the pace. I never talked to Sharon. I didn’t have the energy. It was all I could do to keep the pain at bay…and follow her lead. And, I finished that race in 5 hours and 29 minutes. I felt pure, positive emotion and a rush of adrenalin as I crossed the finish line. It was because of Sharon that I achieved that goal. No doubt in my mind. My plan failed. Hers was better. And, I enjoyed the winning feeling and sense of accomplishment. 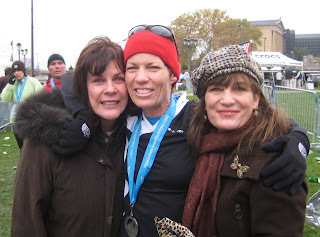 Here’s a picture of my sister, Lynn, me and my sister, Gail, at the finish line. I was overjoyed that they would come and support me. What a day! I am so glad I finished. I am so glad I found Sharon. She challenged me. She showed me the way. Now, I have the medal. How cool is that? Dear, business builder…I am going to challenge YOU. I’ve got a Plan. I call it The Bare Bones Biz Plan. It is a terrific, easy-to-do system for envisioning your winning business and holding yourself accountable for making it happen. How is YOUR business plan working? Are you better off than last year at this time? Are you living the dream? Or are you stuck on the hamster wheel of too-much-work-for-too-little reward? Join me for six weeks. We’ll work together on the phone, via email and webinars. Just do what I tell you to do…and in six weeks you will have a winning PLAN for making your dreams come true. You will know where you stand, and have a simple path for getting where you want to go. You’ll have clarity on WHY you are in business and WHAT you offer and WHO would spend lots of money to have you do just that. You’ll be clear on the score…you’ll know when you are on track, or off track. And you’ll know what needs to be done to get back on track. You’ll be on your way to a better business and a more fulfilling life. You’ll have a PLAN…in writing and in action. What have you got now? Trust me. I will guide you DAY BY DAY for 6 weeks. And, at the end of the program…YOU claim the rewards: A winning business and a better life. You can build a business without my help. However, if your plan isn’t working….why not try mine? The question isn’t…can I do it. The Bare Bones Biz Plan WORKS. The question is…can you keep up? You just have to follow my lead…we’ll do it together one day at a time. Let me know you are ready to do whatever it takes to succeed…that you are ready for The Challenge.